President Trump's wall prototypes are seen from behind the Mexico-US border fence in Tijuana, Mexico, on Dec. 12. With Congress unlikely to fund Trump's wall, Trump is floating other tactics. Times have changed. Mexico still hasn't paid for it, and the GOP-controlled Congress is debating yet another short-term government funding bill that doesn't contain the $5 billion in wall money over which Trump threatened a government shutdown just a week ago. 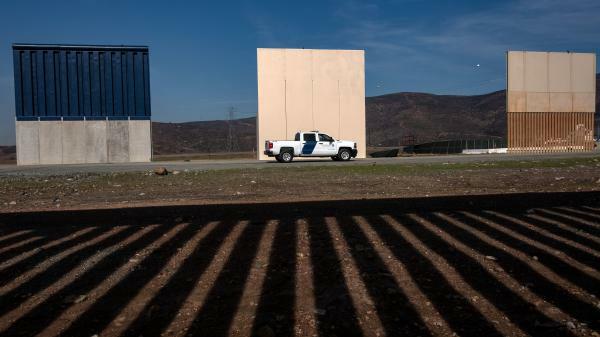 His conservative media allies are rebelling, including Laura Ingraham of Fox News, who tweeted Wednesday, "It was supposed to be a 'big beautiful wall' with a 'big beautiful door.' Now it's just an open door with no frame. Unreal." All of this has Trump offering new and increasingly far-fetched explanations for how the wall will be built and how Mexico will pay for it. In a tweet on Wednesday, Trump offered a new pitch for how the border wall will get done: "Mexico is paying (indirectly) for the Wall through the new USMCA, the replacement for NAFTA! Far more money coming to the U.S.," he wrote. "The United States Military will build the Wall!" Trump talks about the U.S. Mexico Canada Agreement, or USMCA, like the new trade agreement is already in place. It isn't. It still has to be ratified by Congress and the legislatures in Mexico and Canada. So, the president's claim that far more money is coming into the U.S. couldn't possibly be true at this point. But will it be true in the future? "There is no guarantee that on a net basis this trade agreement will produce more economic benefits for the U.S. than NAFTA did in the past," said David Gantz, a law professor at the University of Arizona who focuses on trade agreements. "We don't know yet, and we won't know for several years." Gantz said when NAFTA was approved, backers oversold the economic benefits to the U.S. And while he argues there are some good improvements and updates in the USMCA, they aren't expected to supercharge economic growth in the U.S. Asked about possible economic growth as a result of the USMCA bringing in more tax revenue, Monica de Bolle, a senior fellow at the Peterson Institute for International Economics, said, "We have no guarantee that that would happen including because the USMCA is first of all not all that different from NAFTA." Sanders: "We're talking about additional revenue that wouldn't have existed without the president getting a new deal." Reporter: "Have you done the math on that? That —"
Sanders: "There are — there have been a number of things that we've looked at in which we know will have additional revenue that comes in through the USMCA." Reporter: "Twenty-five billion from the USMCA into the Treasury?" Sanders: "We think we'll have — we think there will be more than that that comes in." It's not clear where her math is coming from, though. The White House Council of Economic Advisers hasn't studied the expected economic impacts of the new trade deal yet, and neither has the office of the U.S. Trade Representative, which led negotiations. If Trump and Sanders are referring to revenue from tariffs, economist de Bolle points out that wouldn't be coming from Mexico, either. "If you are collecting more revenues, it's because you're making your own consumers pay more for something that they were paying less for before," she said. "You're making the Treasury better off at the expense of your own consumers. It's not at the expense of some other country. It's not." Trump also claims that "because of the tremendous dangers at the Border, including large scale criminal and drug inflow, the United States Military will build the Wall!" This raises two questions: 1. Does the military have the authority to build the wall? 2. Does it have the money to build the wall? "To date, there is no plan to build sections of the wall. However, Congress has provided options under Title 10 U.S. Code that could permit the Department of Defense to fund border barrier projects, such as in support of counter drug operations or national emergencies." As for the funding, that is a much stickier challenge. "This is not going to happen," said Todd Harrison, a senior fellow at the Center for Strategic and International Studies, who specialized in military budgeting. Here's why he is making such a bold prediction: "For the military to build the wall, that would qualify as a military construction project, and there's not any money currently appropriated for this — certainly not $5 billion," he said. So, let's say the president decided the military should take money already set aside for something else and use it to build the wall instead — that would require approval from Congress. Harrison says all the relevant committees in both chambers would have to approve shifting, or "reprogramming," the funds. There are also caps on just how much money can be moved that way. "If any one of those committees says no, you can't do it," Harrison said. He has a hard time imagining those committees signing off. "It would be coming at the expense of other priorities in the military," Harrison said. "Even if they agree with the wall, they would say, 'Hey, don't take our money to pay for it. This money is intended for the military. That's what it was approved for, and that's what we want it to be used for.' "
The process would be the same if the Trump administration wanted to shift funds to the wall from other agencies as well. Congress controls the purse strings. And that only becomes a harder sell once Democrats take control of the House and the relevant committees in January. Congress is on the verge of approving a temporary spending bill and avoiding a government shutdown. The Senate passed a short-term measure last night. It heads to the House now. Still, President Trump has not said whether he will sign it. This bill does not have the $5 billion in border wall funding that the president wanted. In recent days, he's offered some new explanations for how that wall could be funded. And NPR White House correspondent Tamara Keith brings us this fact check. TAMARA KEITH, BYLINE: On Day 1 of his campaign, President Trump made this pledge. PRESIDENT DONALD TRUMP: I will build a great, great wall on our southern border, and I will have Mexico pay for that wall. KEITH: Three and a half years later, President Trump has a new pitch for building the border wall. As he wrote on Twitter, quote, "Mexico is paying indirectly for the wall through the new USMCA, the replacement for NAFTA. Far more money coming to the U.S." He concludes, the United States military will build the wall - exclamation point. Much of this tweet is not based in reality. Let's break it down, starting with the USMCA. President Trump talks about it like it's already in place. It isn't, says Monica de Bolle at the Peterson Institute for International Economics. MONICA DE BOLLE: What we have in place right now is still NAFTA until the new agreement gets through the different legislatures that it needs to get through. KEITH: At the White House press briefing earlier this week, Sarah Sanders was asked to explain how the USMCA would pay, even indirectly, for the wall. SARAH SANDERS: We're talking about additional revenue that wouldn't have existed without the president getting a new deal. UNIDENTIFIED REPORTER: Have you done the math on that? SANDERS: There are - have been a number of things that we've looked at, which we know will have additional revenue that comes in through the USMCA. UNIDENTIFIED REPORTER: From the USMCA into the Treasury? SANDERS: We think there will be more than that that comes in. KEITH: It's not clear where her math is coming from because the White House Council of Economic Advisers hasn't studied the expected economic impacts of the new trade deal yet. Neither has the U.S. Trade Representative. David Gantz is a law professor at the University of Arizona who focuses on trade agreements. DAVID GANTZ: There is no guarantee that, on a net basis, this trade agreement will produce more economic benefits for the U.S. than NAFTA did in the past. We don't know yet, and we won't know for several years. KEITH: If Trump and Sanders are referring to revenue from tariffs, de Bolle, who is an economist, points out that wouldn't be coming from Mexico either. DE BOLLE: If you are collecting more revenues, it's because you're making your own consumers pay more for stuff that they were paying less for before. So you're making the Treasury better off at the expense of your own consumers. It's not at the expense of some other country. It's not. KEITH: Let's go back to the second half of President Trump's tweet. He says the United States military will build the wall. TODD HARRISON: This is not going to happen. KEITH: Todd Harrison is a senior fellow at the Center for Strategic and International Studies. And here's why he's making such a bold prediction. HARRISON: For the military to build the wall, that would qualify as a military construction project, and there's not any money currently appropriated for this - certainly not $5 billion. KEITH: So let's say the president decided the military should take money already set aside for something else and use it to build the wall instead. That would require approval from Congress, says Harrison. HARRISON: Keep in mind that this approval process - you have to get all of the relevant committees in both chambers to approve it. If any one of those committees says, no, you can't do it. KEITH: He has a hard time imagining those committees signing off, especially once Democrats take control of the House. Tamara Keith, NPR News, the White House. (SOUNDBITE OF HIDDEN ORCHESTRA'S "TIRED AND AWAKE") Transcript provided by NPR, Copyright NPR.